How to create new contact in pipedrive using Zapier webhook? Which actions and triggers are supported? Do you want to easily maintain a spreadsheet of your unsubscribed recipients? With SalesHandy webhooks, it’s simple! 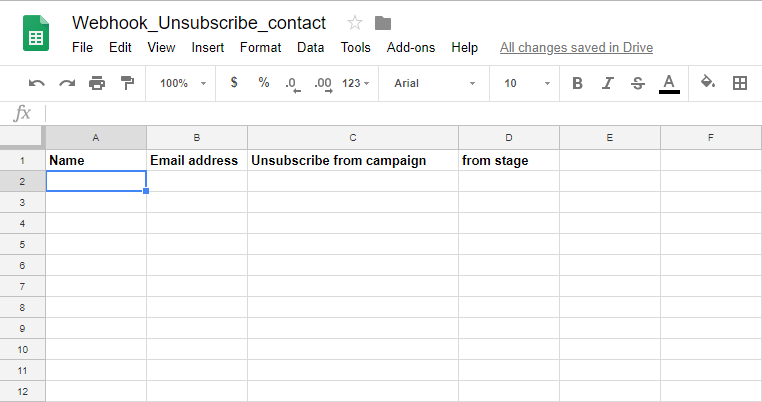 In this guide we’ll show you how to use Zapier to automatically send your unsubscribe contacts to a Google Spreadsheet. Enter heading in the google sheet. Now that you have your spreadsheet ready, be sure to connect SalesHandy to Zapier using our Webhook integration. Follow below steps for creating & integrating webhook. Finally, Zapier will provide you with a Webhook URL. This will be used in the next steps to connect your Webhook to SalesHandy. Go to SalesHandy Webhooks page > New Webhook > paste webhook URL > select module Contact > select event Unsubscribe contact. Then click Test & Save. The final step is to test your Webhook in Zapier to ensure it’s properly connected. Return to the Zap setup screen in your Zapier account and select the "**OK, I did this"** button to test. Once you’ve configured a Webhook Trigger in Zapier, you’ll be ready to create an action for your Zap. Select the Continue button to begin configuring your Action. From the choose an action app screen, select Google Sheets. Choose Create Spreadsheet Row from the options. Then click the Save + Continue button. Zapier will now ask you to choose or connect your specific Google Sheets account. If you haven’t already connected your Google account to Zapier, select Connect a New Account. Once your account got connected, you’ll see your new Google account available to select. Once you select the account, click Test to test the connection. If the test is successful, you will see a Success message. Click the Save + Continue button. IMPORTANT: You can also confirm the data has been correctly added to your spreadsheet, you’ll see a notice added by Zapier indicating test data has been entered. The final step is to turn your new Zap on!